What Spices Are in Chai Tea? Hearty vegetable soup is a satisfying lunch. 4 What Spices Are in Chai Tea? Homemade soups can be as complicated as minestrone or as simple as French onion, which depends on only one vegetable. The broth may be meat-based, such as chicken stock, or strictly vegetarian. Occasionally, a vegetable soup requires a little flavor boost after you've made it. If your soup is not quite as flavorful as you would like, bundle herbs in a cheesecloth bag and let them simmer in the soup for 15 minutes. Fish the cheesecloth bag out and serve the soup. Alternatively, tie a bouquet of herbs by their stems and simmer them. The herbs don't have to cook through because you're removing them before serving. 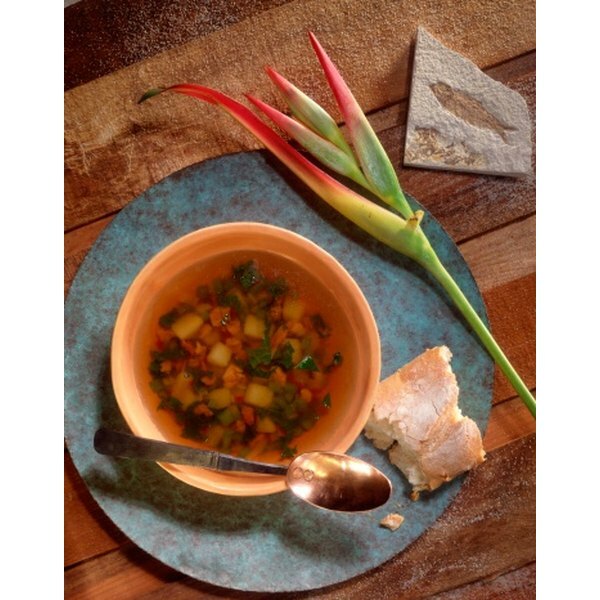 Try a sprig of rosemary, tarragon and chervil for chicken soup. Enrich the flavor of the soup by increasing the level of spiciness. This works well with tomato-based soups or soups of Italian and Mexican nature. Add dried whole chilies, and fish them out after cooking the soup for 20 minutes. Add dried chili flakes. Dice a jalapeno, which is moderately hot, or cut habanero -- which is extremely hot -- in half and add both halves to the soup. Let the soup simmer for 10 to 15 minutes then remove the habanero before serving the soup. Bring the soup to a boil, then lower the heat so that the broth continues to boil vigorously but not a rolling boil -- one that can't be stirred down. The evaporation of water from the soup will concentrate the flavor of the soup. As a bonus, your soup will have a higher ratio of vegetables to broth. Unless you're making vegetarian vegetable soup, meat or poultry adds flavor. Brown 1/2-inch chunks of beef, bacon, pork or poultry in a saute pan with 1 tbsp. of butter. When the meat is browned, remove it and save it for another use. Add additional diced carrots, onions and celery -- also known as the trinity of vegetables in some cuisines -- to the pan. Cook until the vegetables are softened, then add all of it to the soup. Take a cup or so of broth from the soup and deglaze the saute pan. Add the broth back to the soup. Roasting vegetables concentrates their flavors. As they caramelize in the roasting pan, they'll color the vegetable broth a deeper, richer brown. Put sliced onions, carrots and turnips in a roasting pan. Drizzle 1 tbsp. of cooking oil over them and toss them. Place them in a 425-Fahrenheit oven for 30 minutes until the vegetables are a rich brown. Remove, dice and add them to the soup.